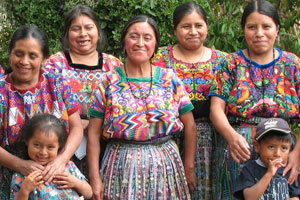 The Xetonox (She-toe-nosh) group of artisans includes six women between 30-60 years old. The women reside in an indigenous rural hamlet in the department of Tecpán, about eight km from the Pan American Highway in the Central Highlands of Guatemala. Nestled in the beautiful scenery of rolling hills and lush greenery, the artisans of Xetonox are skilled on treadle foot looms and use their sewing skills to complete final construction on the products. They have learned to weave 36″ wide fabric by the yard on a treadle foot loom, a craft normally reserved for men. They create beautiful handcrafted fabric for many products, including MayaWorks’ tallitot. Among the first artisans to work with MayaWorks, Xetonox has benefited from literacy programs, weaving and sewing trainings, as well as training on soap-making. Several artisans receive MayaWorks microloans for their small agricultural enterprises. Some projects include growing strawberries, peas, or blackberries, and others use loans to raise piglets or buy parts for their looms. If you’d like to learn more about Vicenta Jutzutz Tetzaguic, one of the new tallit weavers, here’s a link to her story.